A Mumbai Housing Complex Goes Green! I recently read an article which criticized the lack of civic sense in tourists visiting Leh in recent years. It stated how people visiting the valley were inconsiderate about the place and dumped plastic bottles which are not only killing the beauty of the place, but also the environment. However, the sense of goodness has still not died in people. I was pleasantly surprised to learn about a housing complex in Mumbai turning energy efficient and doing their part to reduce the carbon footprint. Raheja Eternity, a housing complex in Kandivli has been actively engaging in various methods such as rainwater harvesting, using solar power, installing LED bulbs and wastewater treatment in order to become more energy efficient. They recently installed 65kW rooftop solar system which entailed a total saving of nearly INR 2 lakhs on their electricity bills per month. More than 200 panels were installed which generate around 260-280 units per day, sufficient for the 230 families residing in the complex. The society has reduced their overall dependence on the grid by 60% drawing over 330 units now, from 860 units per day earlier. This might also be an inspiration for the numerous housing complexes in India to install rooftop solar system which remains in a moribund state in India, despite lofty government efforts. Not only solar, the complex also has a rainwater harvesting unit, wastewater treatment plant in place and uses LED lighting system. The society is setting an example for many neighboring locations, which have also decided to go the green way! It is a great approach to save the environment especially in the Indian cities which are dying because of the terrible air pollution. I urge the people of India to become more environmentally conscious before it gets too late. 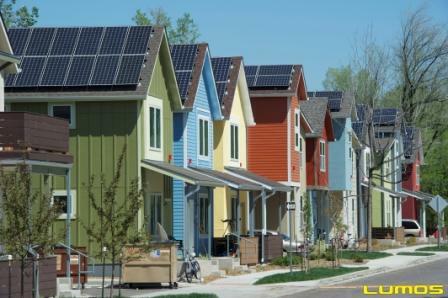 You might also like What returns can I get from a Rooftop Solar System? “We want to live in a place that is better than it was when we got it,” said a resident of the society. If people start thinking in this line, the world will surely become a better place to live in and our next generation will live to see the beauty of nature!